Recently, a four-member delegation headed by CYUPS Secretary of the Party Committee Mr. Ni Bangwen paid Poland and Spain a visit. The other delegation members are CYUPS International Exchange Department Director Mr. Zhang Zihong, Department of Chinese Language and Literature Director Mr. Zhang Xian and International Education Exchange College Vice-dean Mr. Yang Shusen. 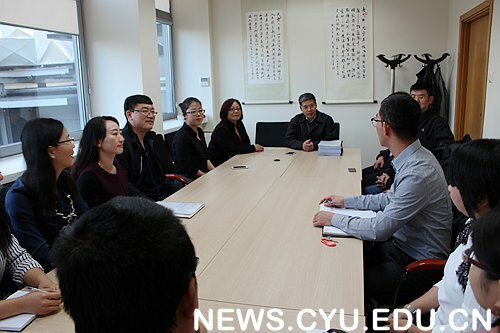 While visiting the University of Gdańsk, they attended the Second Council Meeting of the Confucius Institute jointly established by Gdańsk University and CYUPS, and a seminar was held with Gdańsk University officials. During their visit, they talked with the Institute’s Chinese teachers and student volunteers and in-service training was also carried out. At the Council Meeting, reports on the work of the Confucius Institute and the use of funds of the year 2016 were presented. After reviewing, the attending directors approved the Institute’s major work plan for 2017. It is reported that in 2017, while guaranteeing the quality of Chinese language teaching, the Confucius Institute of Gdańsk University will continue to organize cultural activities such as “Confucius Institute Day” and “Happy Chinese in Poland”. The Institute also intends to hold themed seminars on topics such as “The Belt and Road” “Chinese Painting and Calligraphy” and “Chinese Kungfu”, to organize delegations of principals and student summer camps to visit China and to help the three universities in Gdańsk of Coast Province to establish the Department of Chinese Language and Literature. Besides, it also plans to co-author Polish teaching materials and act as the contractor of the Polish version of Confucius Institute magazine. At the seminar, both parties not only expressed their support for the future development of the Confucius Institute, but also acknowledged their intention to further expand mutual communication and deepen the cooperation channels. According to Mr. Ni Bangwen, both parties could carry out academic research in fields such as youth exchange and youth entrepreneurship. He also extended sincere invitation to Poland’s well-known experts and scholars to visit CYUPS and give lectures and classes, and welcomed Polish students to come and study in CYUPS. After the seminar, a supplementary agreement (summary version) to the Implementation of the Agreement on Jointly Establishing the Confucius Institute at the University of Gdańsk was signed. While at the seminar held between the delegation and the Chinese teachers and student volunteers, the delegation learned about the detailed working and living situation of the teachers and students at the university, after which Mr. Ni Bangwen acknowledged their efforts and contributions, and put forward hopes and demands for their future work at the university. Based on the advice given by the Counselor of Education of the Embassy of Spain in China, the delegation then went to Spain to visit Universidad Rey Juan Carlos, Universidad Antonio de Nebrija, and Universidad Autónoma de Madrid, and seminars were respectively held between them and the university officials. Consensuses were eventually reached on issues including establishing cooperative relations, and launching summer class, short-term credit, dual-degree and teacher exchange programs. 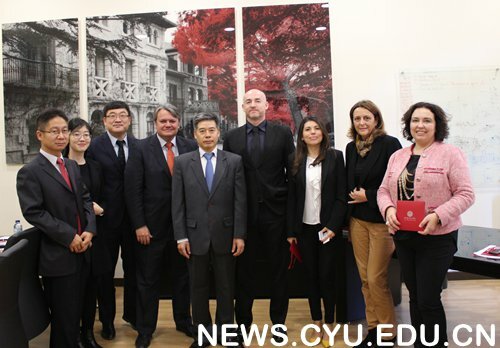 Meanwhile, a two-member delegation headed by Mr. Yang Shusen visited the Confucius Institute at the University of Vienna in Austria and a seminar was held between them and Professor Li Xiade together with other teacher representatives of the Austrian side.